Bandai Namco has confirmed the Western release date for Dark Souls 3. Start practicing your controller-throwing skills now because you've only got a few months until the game arrives. 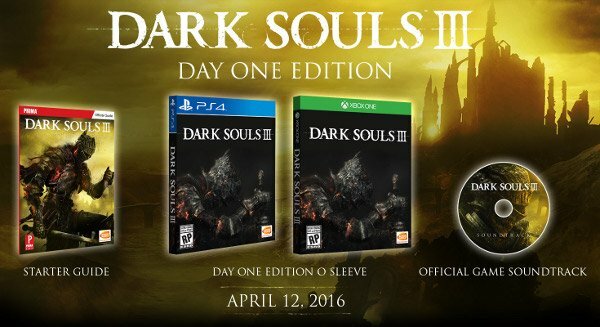 Dark Souls 3 will launch on PS4, Xbox One and PC on April 12 in North America and South America. The game's Japanese debut will happen on March 24th, though, so you'll have plenty of reviews to check out before the game lands in Western stores. There's no special edition available for the PC version of Dark Souls 3. Still, this is the first game in the Dark Souls series to hit PC on the same day as consoles, though, so at least we're making progress. Dark Souls 3, like past games in the series, is an action RPG set in a dark fantasy world. Traps and monsters alike can kill players very quickly so players need quick reflexes or, barring that, the patience to learn from their many deaths. Players can invade each other's games to attack or help fellow adventurers. Developer From Software said in the past that the gameplay for Dark Souls 3 will be based closely on DS2, albeit with tweaks such as additional character options and additional special moves. In an interesting twist, From Software says that this could be the last game in the Dark Souls series. It's hard to imagine them retiring the franchise after so few games, considering how sequel-happy this industry is, but we'll see.